In a cunning twist algebra becomes geometry (or is it the other way around?). Whatever, this approach is not new in the sense that the majority of the original investigation into algebra by the ancient Greek scholars was from a geometric starting point. They didn't even try to separate the two. Perhaps it is a pity that school algebra has been so disposed to symbolic algebra without consideration of visual and kinaesthetic learners. This task goes some way towards giving meaning to topics such as collecting like terms and builds in additive and subtractive use of area. application of the question Can I check this another way? Tak Tiles were designed by Geoff Giles for the DIME (Developments in Mathematics Education) Project. This task is a more sophisticated partner to Task 65, Shape Algebra. 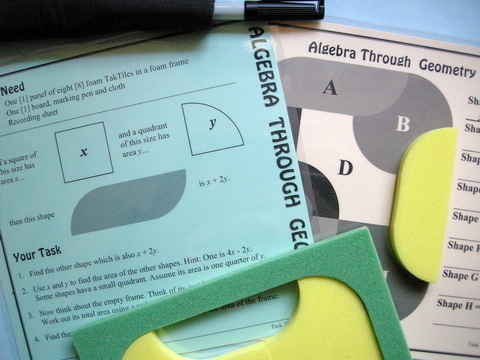 The traditional x and y of algebra are given immediate physical presence in the task and the intriguing foam shapes allow students to see and touch algebraic procedures related to operations on like and unlike terms. The context invites students to apply visual and tactile intelligences, and even the fact that it includes algebraic fraction operations related to halves and quarters is not a barrier to most. Summing these gives a total of 16x + 4y. That is, the total area of the 8 pieces is 16x + 4y. We can also see the same result by realising that the whole puzzle is made up of 16 squares plus 4 rounded pieces in the corners, ie: also 16x + 4y. The Lancashire Grid for Learning web site provides an excellent Investigation Guide which will considerably extend student understanding of algebraic manipulation through further use of Tak Tiles. 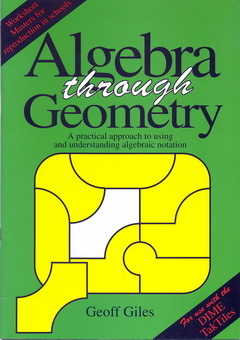 The web site of Brighton & Hove City Council's Learning Platform Hub offers a PDF copy of Geoff Giles original work with Tak Tiles using Algebra Through Geometry. Click the image on the right to reach this page, where you will also find a set of Power Point slides prepared by National Centre for Excellence in the Teaching of Mathematics (NCETM). Other shapes could be designed using x and y. Ask the students to invent some and record them on our Recording Sheet. The original Tak Tile pieces fit together to make a spatial puzzle in a 'rectangle'. So the second level of extra challenge is to create other pieces which also fit into this frame (or a frame of the student's own design). The best way to turn this task into a whole class investigation is to purchase some extra copies of the task and set up a work station. Over a number of days all students can try the task. However, if this is not possible, use the Recording Sheet to redraw the pieces and photocopy your drawing. At this stage, Algebra Through Geometry does not have a matching lesson on Maths300.